At the press screening for “Star Trek: Into Darkness,” the theater was nice enough to offer complimentary popcorn. The gesture couldn’t have been more appropriate. Leaving aside much of the oh-so-serious tone of his first go-round with the pioneering sci-fi franchise in 2009, director J.J. Abrams has delivered an unabashedly fun summer romp that stays faithful to the original series but adds enough rock ’em-sock ’em to lure in a new and younger audience. 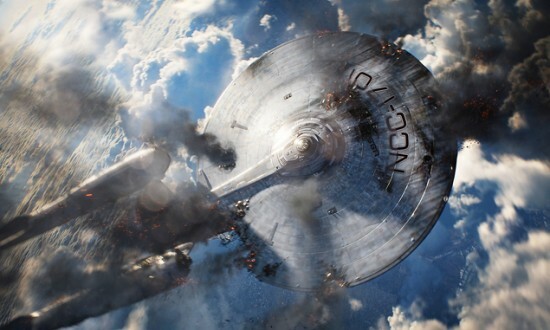 The film wastes zero time thrusting us into the thick of it, as we find the crew of the U.S.S. Enterprise already in several perilous predicaments, involving the natives of a primitive planet and an erupting volcano. Soon thereafter, if the story line begins to feel somewhat familiar, well, it is. 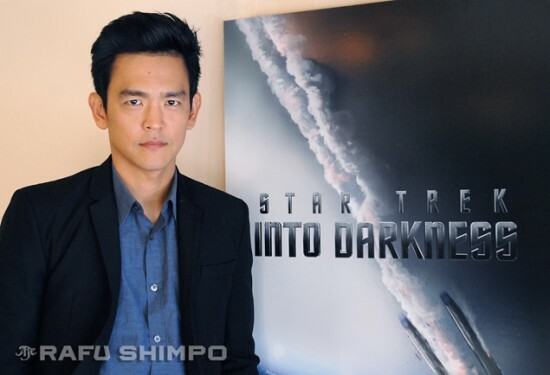 Click on this image to read John Cho’s interview with the Rafu Shimpo about his role in the film. Of the original “Star Trek” feature films, the most entertaining was certainly 1982’s “Star Trek II: The Wrath of Khan.” It pitted Capt. James T. Kirk against his most capable and fearsome adversary and threw in plenty of good old-fashioned, good-guys-versus-bad-guys confrontations. Some detractors may label “Into Darkness” as simply a retelling of “The Wrath of Khan,” and to be fair, it largely is just that. Not to be a spoiler, but there are a few tweaks here and there. If you’re a longtime Trekkie, I’m not ruining any surprises, and if you’re not, it won’t matter anyway. The good news is that you simply won’t care. This is edge-of-your-seat adventure start to finish, and quite possibly the most fun you’ll have at the cineplex this summer. Perhaps the highest possible praise is to say I believe Gene Roddenberry, the visionary who created “Star Trek” for television in the 1960s, would enjoy this latest incarnation. To be brief, the plot finds Capt. Kirk (Chris Pine returning) having been demoted after the fiasco that took place earlier at the volcano. The normal operations of Starfleet are soon interrupted by a ruthless turncoat, who seems bent on nothing short of destroying everything good and wholesome. If you don’t want to know what happens next, quit reading now. Because of this murderous rampage, Kirk is quickly reinstated to helm the Enterprise (no surprise there) and is sent to hunt down the killer, whom we soon learn is the genetically-engineered superhuman Khan Noonien Singh … and he’s got quite a chip on his shoulder. The conflict gains steam, largely on the strength of its villain. Where the original Khan (both in the original TV series and in “The Wrath of Khan”) was played with zesty panache by the late Ricardo Montalban, he’s given a steely coldness in the new film by British actor Benedict Cumberbatch. Basically, there’s something aboard the Enterprise that Khan wants, and revenge is an added bonus. “Into Darkness” touches briefly on moral issues and continues somewhat to explore the delicate and evolving friendship between Kirk and his half-Vulcan first officer Mr. Spock, engagingly reprised by the marvelous Zachary Quinto. All that heady stuff gets pushed aside pretty quickly, though, and honestly, to the movie’s benefit. Hardly a perfect film, it’s got its flaws: there’s far more campy humor and inside jokes than the first outing, and we are presented with a world-renowned scientist and weapons specialist (Alice Eve), who has amassed a lifetime of expertise by the age of 24 or so, just happens to be a pretty blonde, and eventually is reduced to appearing in her underwear. Oh, brother. There’s also a brutal act of terrorism, to which some may be sensitive, as we’re not yet too far beyond the tragic events in Boston and Connecticut. Additionally, I’m not much of a fan for movies presented in 3-D, but in this case, the huge Imax format takes full advantage of the depth offered by the technology over the film’s 132 minutes. A welcomed plus is Zoe Saldana returning as Lt. Uhura, and refreshingly, her character benefits from scripting that showcases some of her lesser-known talents (the ability to speak Klingon, for one). Rated PG-13, the fast-paced action and jarring explosions basically make this an inappropriate choice for the little ones (although someone at the screening actually brought a very young toddler – ugh! ), but longtime “Star Trek” fans will love it. The rest of us will simply be glad we came along for the very entertaining, popcorn movie ride.